Shadrack Mbele has been getting good returns from sugar bean since first planting it in 2014. Sabrina Dean visited him in the eastern Free State to find out more about his production techniques, and how he brought this season’s crop back from the brink of disaster. Sugar bean can be a labour-intensive crop. 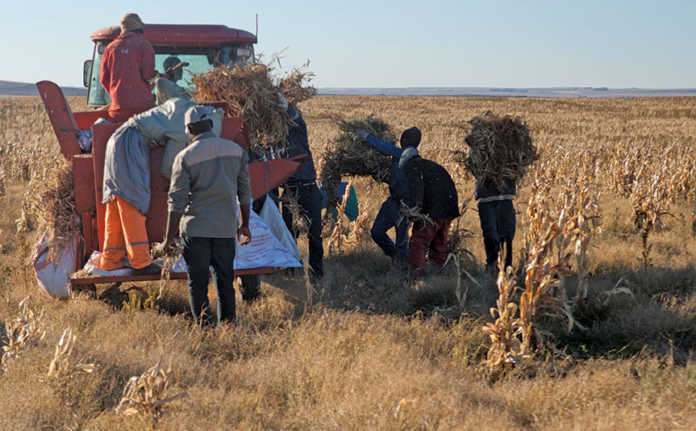 Mbele’s harvester is not equipped with an automatic pick-up, so heaps of plants that were earlier hand-picked have to be lifted manually and transferred into the tractor-drawn harvester. Shadrack Mbele was attending a meeting in Pretoria one morning in February when he received the phone call he had been dreading all season. His cropping manager and nephew, Champion Mbele, told him that a hailstorm had destroyed his entire sugar bean crop, which was uninsured. “I just left my meeting and drove straight back to the farm,” recalls Mbele. Looking at photographs of the sugar bean lands, it is difficult to imagine that anything could have recovered. The crop had been reduced to little more than broken stalks on the 80ha he had leased for the 2017/2018 cropping season. 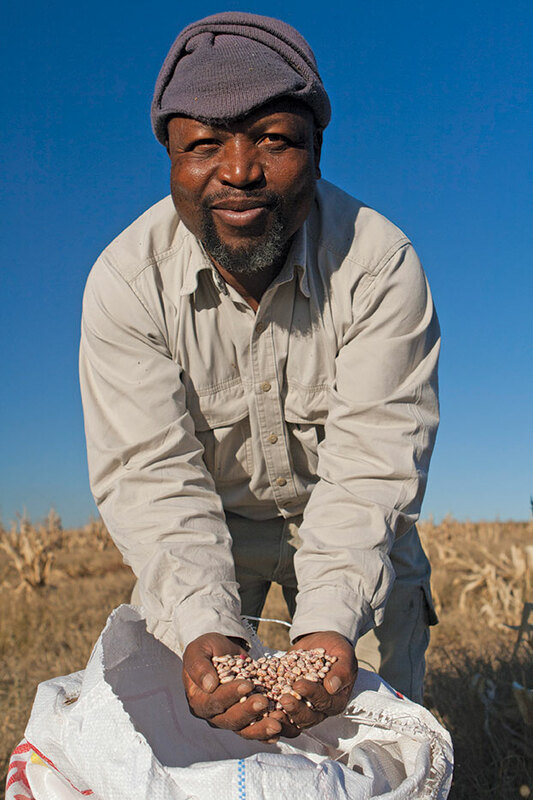 Yet some months later, Mbele managed to achieve a harvest of 1,5t/ha, thanks to getting the right advice at the right time. Mbele lives on his own farm, Danielsrus (226ha), near the leased sugar bean lands, and runs a mixed farming business called Tugela. A second-generation farmer, he inherited the farm, located between Kestell and Harrismith in the Free State, from his father, Ephraime. The latter worked as head stockman for a Dairy Shorthorn farmer for decades, then tried working in a taxi business owned by Mbele. He missed farming so much, however, that in 1993 he leased land at Diyatalawa, and went on to establish his own award-winning Dairy Shorthorn herd. In 1994, he applied for land under the Land Redistribution for Agricultural Development process but received the title deed only in 2010. Mbele spent years working as a teacher in Bethlehem while investing in his other business ventures. He retired from teaching in 2006 and joined his father at the farm full-time, investing all the proceeds from his pension and taxi business in the farm. The farm had only about 60ha of viable cropping land, where the father-and-son team planted crops such as lucerne, oats and radishes for the cattle. Unable to access a production loan without a title deed, they could not expand into a cropping venture. Sadly, his father died in 2012. But Mbele had the joy of planting his first maize crop in the same year and having a “magnificent harvest” in 2012/2013, averaging 7,6 t/ ha. He joined the ranks of the Grain SA 250t maize-producers’ club. In 2014, he diversified into sugar bean, recognising its value as a crop. He says that despite its labour-intensive production, it can deliver good returns, especially with the price peaking at R18 000/t in recent years. Shadrack Mbele displays some of his sugar bean crop harvested on 80ha of leased land. This, coupled with the stability of World Food Programme (WFP) contracts in 2016 and 2017, has made sugar bean production a lucrative business. 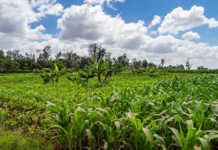 Production and harvesting costs are much higher than for a crop such as maize, however. Mbele’s inputs are about R10 500/ ha and he adds to the cost by hand-picking his bean plants before they are put through the harvester. Unfortunately, the 2017/2018 season faced challenges from the outset, starting with a delay in the payment of a production loan that had been approved. By this time, Mbele had already found lands to lease, so he decided to finance his crop inputs from his own pocket. This was a huge risk, as he did not have sufficient capital to include insurance. Despite these challenges, Mbele managed to plant his beans before Christmas and they were progressing well until the dreaded phone call. Confronted with a land full of stalks early in February, Mbele thought all was lost. However, the crop was not yet at flowering stage, so he swiftly got in touch with some of the people he considers partners in his cropping business. This includes Jan Ballot of Nulandis, who advised him to apply Alexin, a liquid organic nutrient complex containing salicylic acid. Mbele says that sugar bean plants start flowering and setting seedpods 60 to 70 days after planting, with seed development taking place at 80 to 90 days. He believes that he was just in time to allow for the leaves to recover and seeds to develop properly before the season came to an end. In addition to the nutrient complex, he also applied a booster product, Kunfu. Mbele stresses that as a new commercial farmer, he has greatly valued being able to call on good advice at a moment’s notice. He has also received mentorship from Grain SA, and help from his fertiliser consultant, Pontsho Mokoena of Kynoch. “Pontsho opened my eyes when it came to cropping,” he says. According to Mbele, clean lands and good timing are crucial when planting sugar bean. The soil should also be well-drained. The optimal planting window for his area is from 24 November to 20 December. When preparing lands, he avoids ripping, as this allows too many weeds to germinate. Instead, he ploughs the soil before levelling, after which he tries to plant within three days to enable pre-emergence spraying. He carries out pre- and post- emergence spraying for weeds based on recommendations made by his chemical company. Mbele stresses the importance of being hands-on with the crop, monitoring daily for any signs of pests or disease. He pays particular attention to potassium when fertilising. According to him, many cultivars of sugar bean are available. He previously planted Kranskop, but is now using Pan 148 as he finds that it results in less wastage. The plants are hand-picked and left in heaps on the land for at least three days. The piles are then fed manually into a tractor-drawn Agrico sugar bean harvester. Mbele hopes to upgrade to a harvester with an automatic pick-up in future. The residue left behind is baled for livestock feed. Mbele has played a prominent role in organised agriculture structures over the past few years and until recently served as the Free State chairperson of the African Farmers’ Association of South Africa (Afasa). He has, however, stepped back from certain responsibilities in order to dedicate more time to growing his farming business. Like his father, Mbele considers himself a stockman at heart but admits that he has discovered a whole new world of opportunities made possible by cropping. “I am inspired at the way the commercial crop farmers are doing things,” he says. He still runs a small dairy, milking about 24 cows twice daily, but this is more for the love of the cattle and keeping his father’s legacy alive than for any real profit. His crops and his transport business, built around ownership of a grain hauler truck, are his main cash-flow generators. He also owns approximately 200 Mutton Merino sheep, bought in 2016, and has ordered his first 50 Beef Shorthorn cattle, which he intends running on leased land near Lindley. 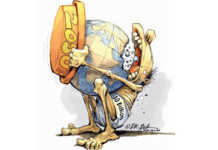 He says political instability and the cost of inputs are among the biggest challenges facing South African farmers, in addition to a lack of skilled extension support, crime and climate change. Nonetheless, he is convinced that farming has a “great” future, as long as people are willing to persevere. Phone Shadrack Mbele on 078 879 3502, or email him at [email protected].